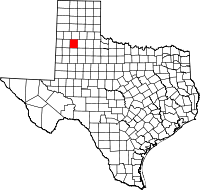 Hale County is a county located in the U.S. state of Texas. As of the 2010 census, its population was 36,273. 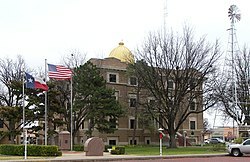 The county seat is Plainview. The county was created in 1876 and organized in 1888. It is named for Lt. John C. Hale, a hero of the Battle of San Jacinto. It is home of the noted former Hale County Judge, Judge Bill Hollars a.k.a. "Hang 'Em High" Hollars. Hale County comprises the Plainview, TX Micropolitan Statistical Area. 7000 b.c. Paleo-Indians first county inhabitants. Later Native American inhabitants include the Comanche. 1876 The Texas legislature forms Hale County from Bexar County. 1881 Brothers T.W. and T.N. Morrison, and W.D. Johnson, establish the cattle Cross L Ranch and the XIT. 1883 New York Methodist minister Horatio Graves becomes the first white permanent settler in the county. 1886 The city of Plainview has its beginnings when sheep rancher Zachery Taylor Maxwell moves his family and 2,000 sheep from Floyd County to the site of two hackberry groves on the old military trail established by Col. Ranald S. Mackenzie. The city’s name comes from the area’s vista. 1888 The county is organized. Plainview is the county seat. 1900 The county has 259 farms and ranches, with a population of 1,680. 1906 The Santa Fe Railway comes to Plainview. 1906 Wayland Baptist College is founded in Plainview. 1909 Businessman Levi Schick opens the Schick Opera House in Plainview. 1911 The county's first motor-driven irrigation well is drilled. 1912 The Texas Land and Development Company is organized in Plainview. The purpose is to entice settlers by dividing a large tract of land into individual farms, and preparing each farm for occupancy. 1944 Plainview Site is discovered. In addition to bone and man-made artifacts, archeologists find the remains of 100 extinct bison about twice the size of modern size. 1946 Oil is discovered in the Anton-Irish field of Lamb and Hale counties. 1969 Country artist Jimmy Dean, brother Don Dean, and cousin-in-law Troy Pritchard found the Jimmy Dean Sausage Company and open the Jimmy Dean Meat Company in Plainview. 1986 Hale County is one of 62 counties in Texas still legally barring the sale of alcohol. According to the U.S. Census Bureau, the county has a total area of 1,005 square miles (2,600 km2), of which 1,005 square miles (2,600 km2) is land and 0.1 square miles (0.26 km2) (0.01%) is water. As of the census of 2000, there were 36,602 people, 11,975 households, and 9,136 families residing in the county. The population density was 36 people per square mile (14/km²). There were 13,526 housing units at an average density of 14 per square mile (5/km²). The racial makeup of the county was 66.77% White, 5.79% Black or African American, 0.92% Native American, 0.30% Asian, 0.04% Pacific Islander, 23.76% from other races, and 2.42% from two or more races. 47.90% of the population were Hispanic or Latino of any race. There were 11,975 households out of which 40.40% had children under the age of 18 living with them, 60.30% were married couples living together, 11.60% had a female householder with no husband present, and 23.70% were non-families. 21.00% of all households were made up of individuals and 10.70% had someone living alone who was 65 years of age or older. The average household size was 2.86 and the average family size was 3.32. In the county, the population was spread out with 30.20% under the age of 18, 11.40% from 18 to 24, 27.20% from 25 to 44, 18.30% from 45 to 64, and 12.90% who were 65 years of age or older. The median age was 31 years. For every 100 females there were 102.40 males. For every 100 females age 18 and over, there were 101.30 males. The median income for a household in the county was $31,280, and the median income for a family was $35,250. Males had a median income of $26,007 versus $20,057 for females. The per capita income for the county was $13,655. About 14.30% of families and 18.00% of the population were below the poverty line, including 23.30% of those under age 18 and 14.80% of those age 65 or over. ^ Gannett, Henry (1905). The Origin of Certain Place Names in the United States. Govt. Print. Off. p. 147. ^ a b c d Leffler, John. "Hale County, Texas". Handbook of Texas Online. Texas State Historical Association. Retrieved 16 December 2010. ^ a b "Minister Horatio Graves". Plainsview and Hill County History. Plainview Chamber of Commerce. Archived from the original on 18 June 2011. Retrieved 16 December 2010. ^ Turner, Matt Warnock (2009). Remarkable Plants of Texas: Uncommon Accounts of Our Common Natives. University of Texas Press. p. 19. ISBN 978-0-292-71851-7. ^ Davis, Charles G. "Plainview". Handbook of Texas Online. Texas State Historical Society. Retrieved 16 December 2010. ^ "Plainview, Texas". Texas Escapes. Texas Escapes - Blueprints For Travel, LLC. Retrieved 16 December 2010. ^ "Santa Fe Railway". Texas Escapes. Blueprints For Travel, LLC. Retrieved 16 December 2010. ^ Brackney, William H (2008). Congregation and Campus: Baptists in Higher Education. Mercer University Press. p. 240. ISBN 978-0-88146-130-5. ^ "Schick Opera House - Plainview, Hale County, Texas". Texas Historical Markers. William Nienke, Sam Morrow. Archived from the original on 28 September 2011. Retrieved 16 December 2010. ^ Brunson, B R. "Texas Land and Development Company". Handbook of Texas Online. Texas State Historical Association. Retrieved 16 December 2010. ^ Gibbon, Guy E (1998). Archaeology of Prehistoric Native America : An Encyclopedia. Routledge. p. 655. ISBN 978-0-8153-0725-9. ^ Totten, Robert T (1956). "General Geology and Historical Development, Texas and Oklahoma Panhandles: ABSTRACT". AAPG Bulletin. 40. doi:10.1306/5ceae382-16bb-11d7-8645000102c1865d. ^ Calhoun, Fryar (August 1983). "Jimmy Dean". Texas Monthly: 120–123, 198–200, 206. ^ "Wet/Dry Status of Texas Counties as of November 2010". Texas Alcoholic Beverage Commission. Retrieved 16 December 2010. ^ "2010 Census Gazetteer Files". United States Census Bureau. August 22, 2012. Retrieved April 28, 2015. ^ "U.S. Decennial Census". United States Census Bureau. Retrieved April 28, 2015. ^ "Texas Almanac: Population History of Counties from 1850–2010" (PDF). Texas Almanac. Retrieved April 28, 2015.